The B-200 is a cost effective solution for general utility applications. 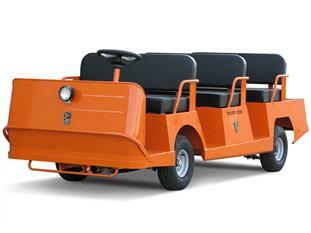 It is available with a second seat for use as a personnel carrier. Vehicle performance meets or exceeds the demands of many applications while reducing emissions, lowering maintenance expenses and reducing operating costs. 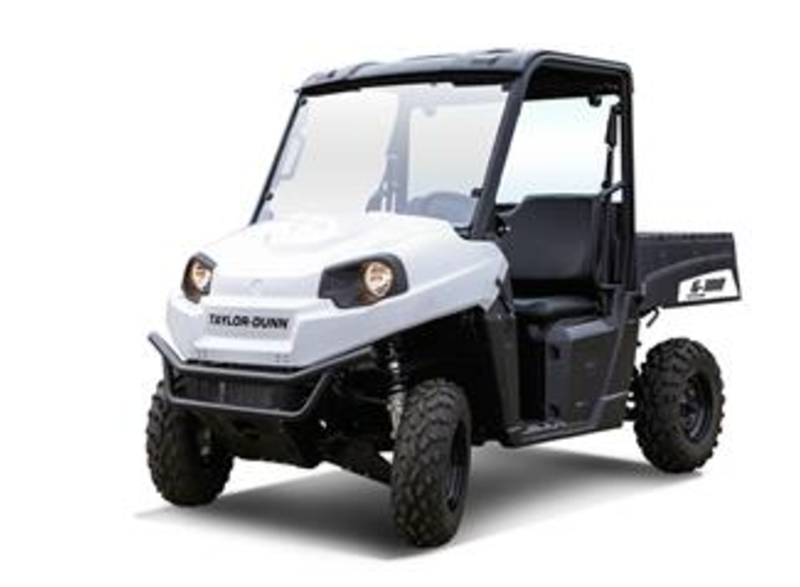 When a tram is required to transport personnel in and out of industrial plants, campuses, theme parks, parking lots, or airport complexes, this Taylor-Dunn model G-150, gas-powered personnel carrier passenger tram, provides the perfect solution. Equipped with the drop side curtains, top and safety glass windshield, inclement weather is not a deterrent. The custom MX-600 includes a steel cab with windshield, snap-on roll down enclosure with zippered access, snap-on vinyl at rear window, strobe light on roof, headlight and taillight, 2 inch ball hitch at rear and painted white. The TC-50E is an 80 volt AC powered electric tow tractor that has 3,000-5,000 pounds (1,361 to 2,268 kgs) of drawbar pull. With its low profile and compact design, the TC-50E AC provides excellent visibility and ergonomics for optimal driving capability. 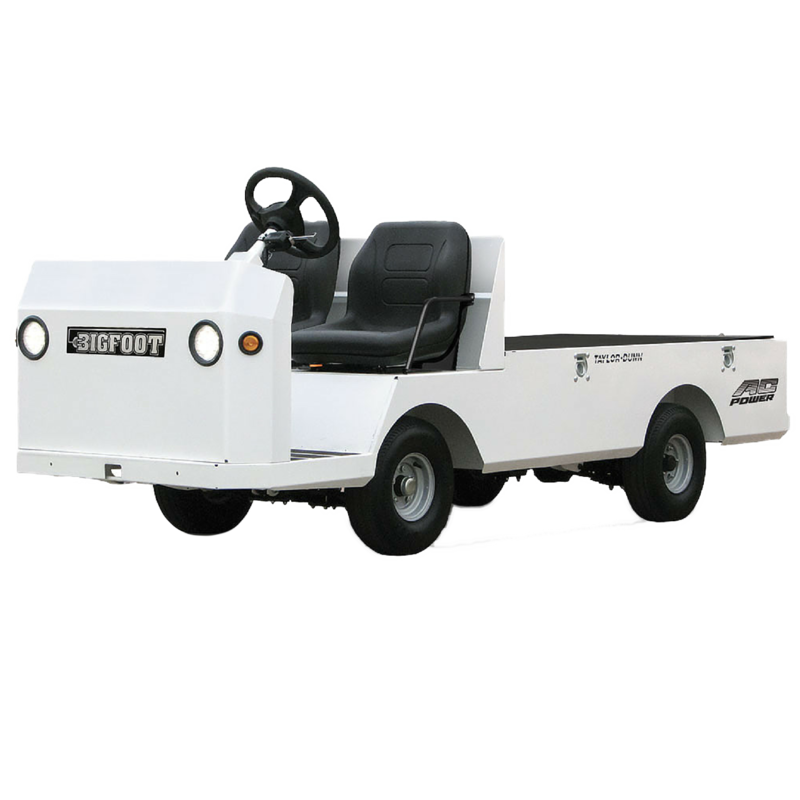 An addition to the BIGFOOT line of electric "Comfort & Performance" vehicles, the BF-3000 is a utility vehicle which competes with gasoline vehicles in outdoor applications. The R-380 Roadmaster is designed to provide the ultimate versatilty in today's work environment. This vehicle utilizes 16 gauge steel uni-body design that ensures years of service in rugged applications. The SS-536 provides personnel transportation for executive, supervisors, security, maintenance, mail carriers and other workers whose jobs keeps them on the go. 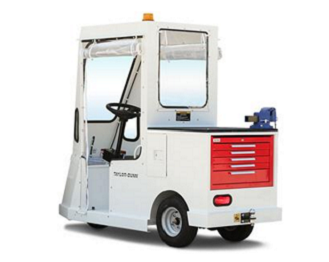 The Taylor Dunn BT-280 electric shuttle is designed to move personnel in high-traffic low-speed locations such as on a corporate or school campus. When equipped with 9 or 12 passenger trailers, this passenger tram can carry over 30 people in a single trip. When first class comfort is your competitive advantage, Taylor Dunn's FT-280 Aristocrat passenger tram is the superior choice. Equipped with standard front and rear shock absorbers, this electric shuttle is designed for passenger comfort at speeds up to 12 mph. Taylor-Dunn's T-942 is a 12-passenger trailer designed for use with the BT-280 E-Tram personnel carrier to transport up to 20 people in one trip. The Electruck product line is designed to provide an electric alternative to your current fleet of full sized utility pickup trucks. The B-254 series product line of electric personnel and burden carriers offers the ultimate versatility in load capacity, vehicle configuration and vehicle performance. The C-415 is designed to provide a reliable, cost-effective solution to your narrow aisle material handling requirements. 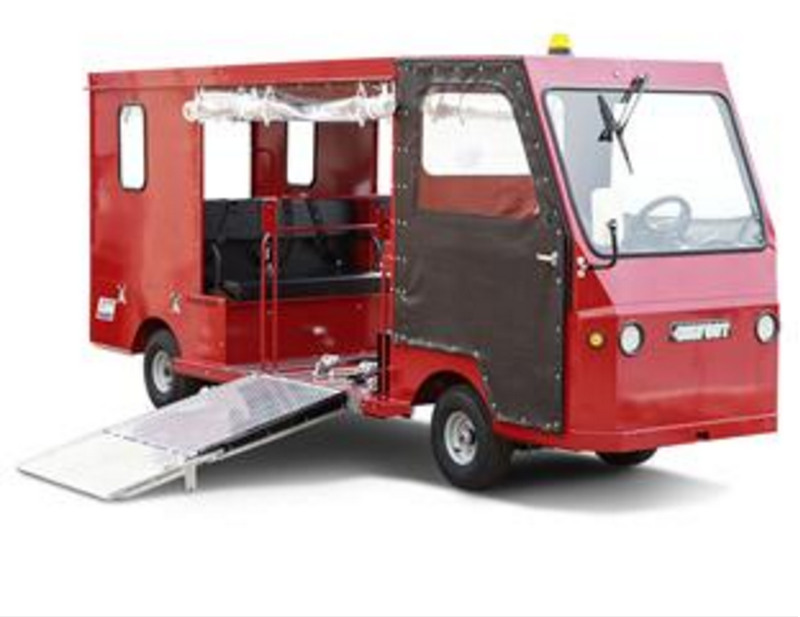 This vehicle is compact and maneuverable yet still carries up to 2,000 pounds. The Taylor-Dunn MX-1600 is a product solution designed to move a repairman, tool chest, and workbench to down equipment in less than one-third of the time required by conventional methods. Taylor-Dunn’s C-432 has the shortest turning radius available in a sit-down combination burden carrier/tow tractor. With a 28” wheel base, these vehicles can maneuver into corners other powered trucks simply cannot reach – indoor or outdoor. Taylor-Dunn’s Bigfoot offers ergonomic comfort, a heavy duty all gear drivetrain, and all-wheel hydraulic disc brakes. 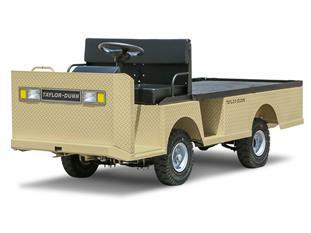 Taylor-Dunn electric shuttles can be customized to accommodate wheelchair users. This custom Bigfoot has room for six guests plus a wheelchair passenger. 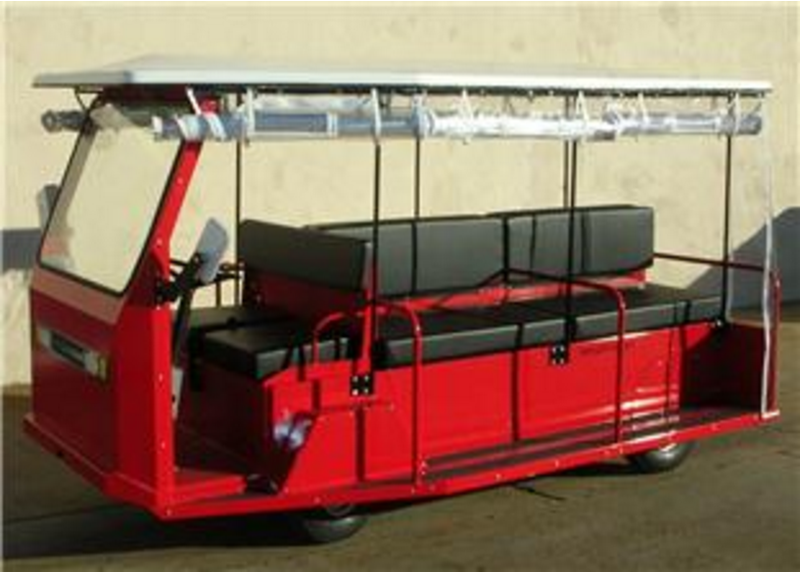 This passenger tram also includes an electronic wheelchair ramp, steel roof, full enclosure, vinyl doors, strobe light, side view mirrors and directional signals. The new Bigfoot XL has ergonomic comfort, larger operator's compartment, hill climbing gusto, speed up to 18 mph, and all-wheel hydraulic disc brakes. The TC-30/60 is a proven tow tractor with 3,000 to 6,000 lbs of drawbar pull. The ET-3000 is the next generation of electric utility vehicles to compete with the performance of gasoline vehicles in outdoor applications. The model SS-534 provides personnel transportation for executive, supervisors, security, maintenance, mail carriers and other workers whose jobs keeps them on the go. Designed to move personnel in crowded, low-speed environments such as corporate or school campuses, the E-Tram electric shuttle can carry 8 passengers, up to 30 people when equipped with a 9- or 12-passenger trailer. Taylor-Dunn's T-941 is a 9-passenger trailer designed for use with the BT-280 E-Tram personnel carrier. The B-210 AMB is designed to provide a cost effective solution for your ambulance applications. Vehicle performance meets or exceeds any comparable gasoline powered vehicles while providing lower maintenance and operating costs. The B-210 is designed to provide a cost effective solution for your utility applications. Vehicle performance meets or exceeds any comparable gasoline powered vehicles while providing lower maintenance and operating costs. The B-210 EE is designed to provide a cost effective solution for your utility applications. Vehicle performance meets or exceeds any comparable gasoline powered vehicles while providing lower maintenance and operating costs. With a load capacity 1,600 lb, the B-150 is one of the most cost effective solutions to your material handling needs. Equipped with a 36-volt electric drive train, this vehicle is designed with one of the shortest turning radii in its class. The Taylor-Dunn SC-100 48V is a cost-effective solution to improve efficiency in any warehousing application. This unique narrow aisle, highly maneuverable vehicle provides an ergonomic advantage to the operator by bringing him closer to the material to be picked. 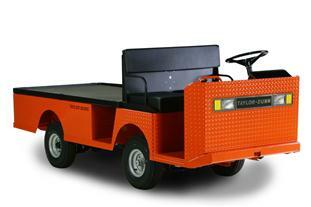 The G-100 is a gasoline-powered vehicle designed for outdoor applications . With large knobby tires and high ground clearance, it's perfect for schools, universities, nurseries, parks, or any other place where you need to move over rough terrian. 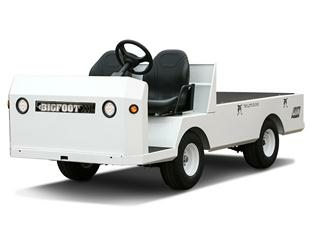 This Bigfoot XL Ambulance is highly customized with windshield in frame, fiberglass top, drop-down sides, lockable steel box with two shelves, rear locking doors, additional locking storage compartment under gurney on passenger side, full enclosure, side view mirrors, windshield wiper, galvanized deck, and full sized gurney with access at side and rear. The TC-80/120 is a proven medium duty tow tractor with 8,000 to 12,000 lbs of drawbar pull. The Tiger Cub tow tractor has been completely redesigned to provide a compact, highly maneuverable solution for towing requirements demanding drawbar pull of 3,000-5,000 lbs. The 4-wheel SS-546 provides time proven reliable personnel transportation for executive, supervisors, security, maintenance, mail carriers and other workers whose jobs keep them on the go. 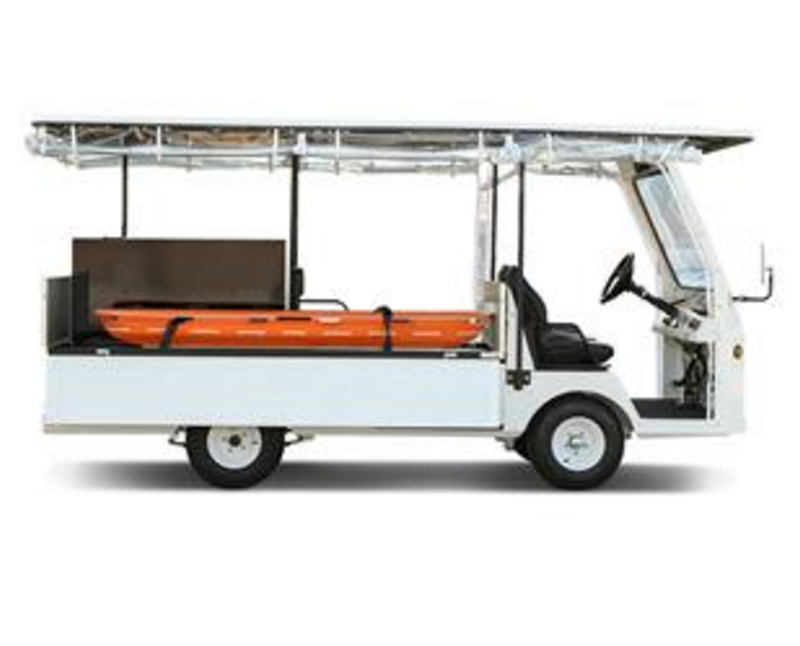 Taylor Dunn's BT-280 48V GT electric shuttle can transport up to eight people and travel at speeds of 10.5 mph, while providing a range of 24 miles in a single charge. Low step height and excellent visibility while traveling at low speeds in congested areas make BT-280 an ideal solution for your personnel moving applications. The BT-280 electric shuttle is designed to move personnel in low-speed environments such as corporate or school campuses. When equipped with 9 or 12 passenger trailers, the BT-280 can carry over 30 people in a single trip. This product was discontinued by Taylor-Dunn in August 2018. Please view Taylor Dunn's B-200, which is available with a second seat. The B-100 is designed to provide practicality and convenience in both industrial and commercial applications. With its standard four passenger, forward facing seating configuration, it is the most economical personnel carrier in its class. 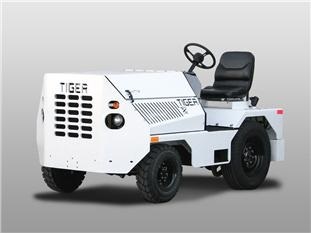 The T-48 GT is one of the first electric utility vehicles that can compete with gasoline vehicles performance in outdoor applications. Model B-238 is a three wheel electric burden carrier that offers the ultimate versatility in load capacity, vehicle configuration and vehicle performance. The unique modular design allows configurations to provide precise solutions to your needs. The B-200 is a cost effective solution for your general utility applications. Vehicle performance meets or exceeds the demands of many applications while reducing emissions, lowering maintenance expenses and reducing operating costs. The model G-150’s versatile design allows the vehicle to be built to your specific needs. Equipped with a 18 hp overhead valve four-stroke engine that delivers plenty of power through a variable pitch torque converter, the G-150 is ideal for rugged outdoor applications. The B-125 is designed to provide a practical solution for utility vehicles applications in the commercial and industrial market. Whether your application is carrying light loads or moving people, the B-125 meets your needs. Toyota Material Handling is Northern and Central California's leading provider of Material Handling products and services.